Figure 2-30. Time-Travel and Time-Velocity Curves ior Complete Cycle of Operation. The effect of this loss is shown in fig. 2 31 by the curve designated as step 2. The loss due to the effect of the spring constant is determined by the method of step 4 and the modified curves are designated as step 5. The performance of step 6 produces no significant change in the curves and therefore the curves designated as step 5 represent the effect of the bolt driving spring on the bolt motion. 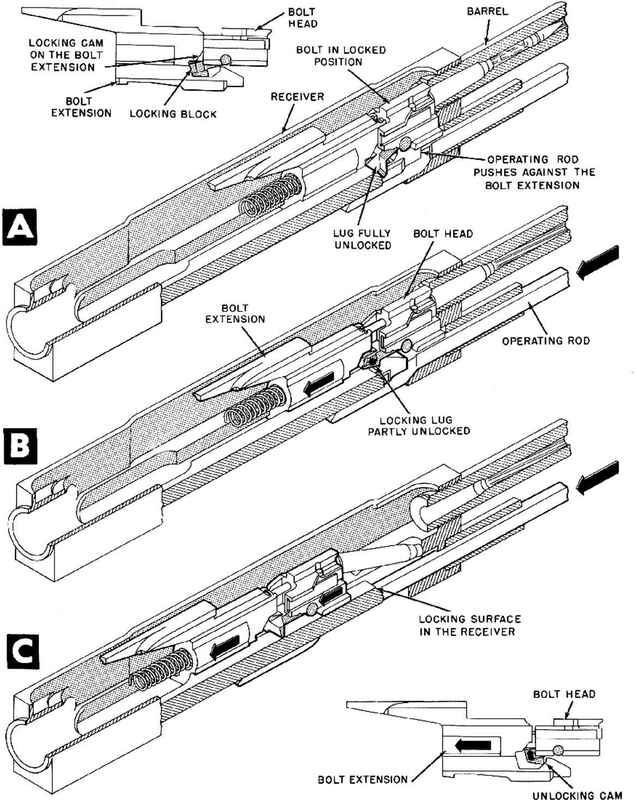 The curves show that the bolt reaches the required additional travel of 0.713 foot at 0.216 second and it is at this point that the bolt reaches the backplate buffer. Note that the striking velocity is 51.5 feet per second. The data from fig. 2-31 are used to extend the bolt motion curvcs in fig. 2-30 up to the time the backplate buffer is struck.